I am working with HoneyBaked Ham and have received free product and compensation for writing this post. All opinions are my own and honest. Easter comes early this year, April 5th! I went shopping for our Easter dinner at my local HoneyBaked Ham store here in Grand Rapids, Michigan. Serving up ham and turkey is an Easter tradition that everyone looks forward to each year. I first looked at the HoneyBaked menu and pricing online and then called in my order to be extra certain all the items we wanted would be available. The staff is always super friendly and helpful, they set aside the items I needed so that my Easter dinner would be perfect. My biggest tip for a flawless Easter dinner is to plan ahead, saves me every time. I want to make memories with my family and not have to worry about the meal details. I like HoneyBaked so much, their products are premium, easy to serve and super yummy! The table does not have to be super elaborate or look like it was designed by Martha Stewart herself. First thing to do is pick out a really great table cloth that you love. I always choose cloth and I recommend looking in the clearance areas because you never know, you may find an expensive table cloth for just a few bucks like I did! Next step for the perfect table is finding a simple centerpiece. I used some items that were already around at home, no need to rush out and spend tons of money on anything. 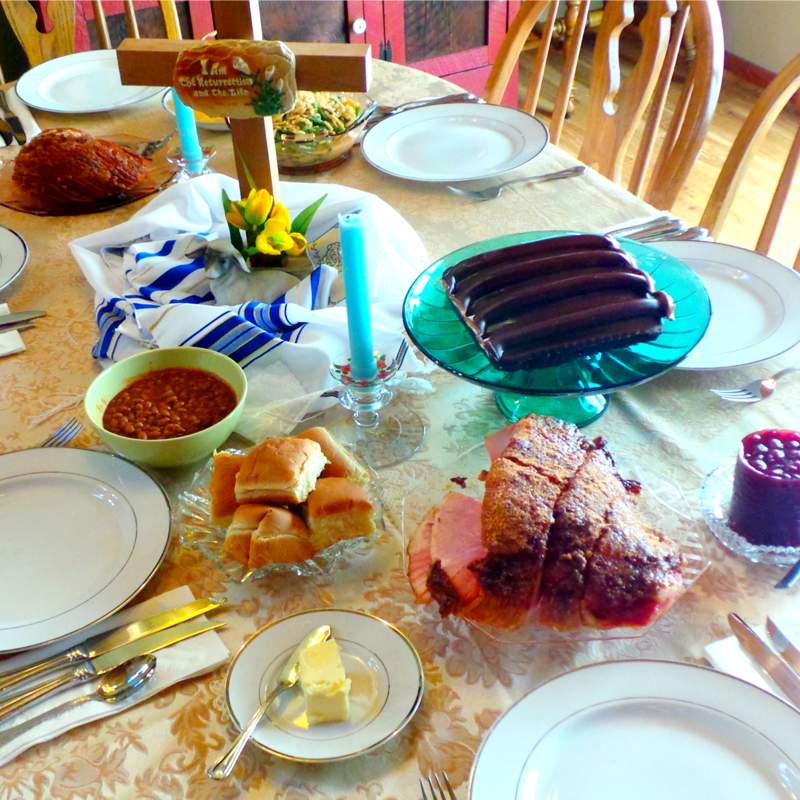 A couple candles added to the mix and my simple table setting was just right for our Easter family dinner. All of the serving platters and dishes are vintage/antique finds from thrift stores or family inheritances. The plates I like to keep simple. If ever in doubt white tableware is the best way to go and with minimal embellishment. If you want to make it look a little fancier then perhaps some simple place-mats would be a good idea along with cloth napkins.